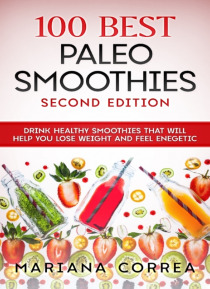 Regardless of your fitness routine, if you're interested in losing weight or just need an extra boost of energy after an intense workout this book with 100 Paleo smoothie recipes has a recipe for everyone. Smoothies have fantastic benefits such as:- Smoothies can help build muscle and improve your overall athletic performance. - They are delicious and low in calories but very filling, making the… m a great option for losing weight. - Smoothies are a great way to introduce more fruits and vegetables into your diet. - They will allow you to detox. - They can help boost your immune system. - Smoothies will make you look fantastic! By supplying your body with all the vitamins and minerals it needs you will begin to glow from the inside out. The recipes are fast and easy to follow with healthy and affordable ingredients such as free radical-fighting raspberries, calcium rich spinach and delicious coconut milk.